I hope you’ve been reading along at The Archive-Along this week? I think it’s a fascinating series of posts and a important topic, archiving your digital stuff. You create so much on the computer – but do you take regular backups? You should. What should we DO with all the photos we take? I’ve been taking digital photos for over six years now and the system I have of filing them in folders (named by date) is working great for me. I love everything that is ordered chronologically! It reminds me of life passed, in a good way. It’s the way I write in and archive my diaries. It’s the way blog posts work too. So I store digital photos by year, and plan to make a few backups of documents and photos to another hard drive soon. But when and how will I ever look at all these photos? I sure ain’t no scrapbooker, even though I used to glue photos onto card-stock and make big heavy Photo Albums when I was younger. Now I don’t any more. I think it’s because the amount of photos has grown exponentially with the digital era. I can take as many photos in just an hour now as I did in six months with film. Oh how I love the wonders of the modern age sometimes. To create your own photo book. Wow, right? So that’s exactly what I have done! I’m a sucker for making books, as you might know. An archive for me would have to be something tangible, something away from the computer. One printed book, or several because I’m quite productive. I love everything about books, and I enjoy the process of making them. I made a book from one year of my blog back in 2006. It’s called A Creative Year and it’s published at Lulu where you still can get it. It’s about time I do a couple of more of those blog books, don’t you agree? I would love to have my whole blog as a series of books, but making books takes a lot of time as I talk about in the interview over at CraftyPod three years ago. So while not tackling that yet I’ve started another series of books just for me! They are photographic memory books, or you could call them plain ol’ Photo Albums, coz’ that’s what they are. I say “they” though I’ve only printed one so far, via Blurb. I’m now working on both 2009 and 2010 at the same time. I decided to do a year of photos in one book, and just pick the ones I liked most and use those. Not concentrating on a theme or do a specific photographic project, just that one place to view a years worth of photos. Mmm! I will show more images from the book and write a bit more about the process of making this specific book later. This one won’t be for sale because many of the photos are too private (of family and friends). But I must say I’m in love with it, and had to share it with you. I hope you will be inspired to make a book yourself. My family have been looking through it several times and I’ve received such nice reviews from them that make me extra proud. A photo archive in book form is a great project for many reasons, happiness being the largest part! Happy memories of the past are an effective way to make yourself happier in the present, and things like photo albums, mementos, and one-sentence journals are great ways to keep happy memories vivid. One problem is that the minute I put one album together, it’s time to start the next! After I do my next one, I think I will create some sort of schedule – to work on it for an hour once every two weeks – so I feel like I’m on top of it. Finishing mini-steps will make it easier to finish a major projects. Having a record of one years worth of photos reminds me what I did – and didn’t do. 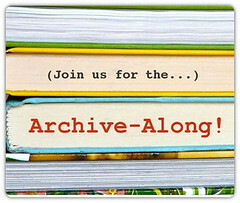 So run along now, to read some posts at The Archive-Along, for example Diane’s post Making a book from your blog (something I already did once, a book called A Creative Year and it’s still available) or start going through your digital photos and all those folders to make something useful out of all those photos! 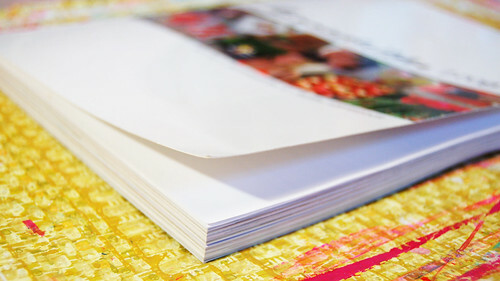 I’d love to see your finished Photo-album-printed-book, let me know how it goes! If you wan to get started right away you should visit Blurb where you can get your own books printed. I have been using InDesign to Make my Blurb Book, and I love it! If it rains tomorrow too I’ll be back then. ** Curious of how my book turned out? Check out the photo project with a years worth of photos. This entry was posted in Best of the Blog, Organizing, Photography and tagged BLURB book, memory keeping, photo book, photo idea, print on demand, year book. Bookmark the permalink. Wow, a personal yearbook. Wouldn’t it be fun to have all your friends sign their photos and write you little notes on the pages like you do with highschool yearbooks? Thats a great idea. I have been wondering how to make a lot of fotos into something worth having for a little girl I am sharing some time with. She stays with me every third weekend and a lot of fotos are documenting her stay with me. This was just what I needed, thank you for sharing your idea. Thank you, Hanna. I so want to make a year a photos. We creative types are usually organizationally challenged, I know I am, so this is really helpful! thanks for comment and the birthday wishes, hanna! i simply love your papers and collage things i got on etsy and can’t wait to use (and blog about) them. actually, i might just save them forever because they’re so pretty! i would love to make my own blog book ~ but i can’t figure out how to download my entries without having to type them all out. when i try to download it, it copies all of the HTML and none of the actual text or photos! very frustrating. when i have $50 to spare, i’m absolutely going to buy your book! make more, i say! :) and by the way, i think your voice on the interview was so sweet and you have such a beautiful accent – it was such a treat to get to listen to you! Thanks for the tip! That might actually be really useful. I have the same thing. I’ve got so many pictures on different hard drives, because if I leave them all in my iPhoto library, the program usually crashes. I am pretty sure I won’t be able to turn them all into books, since there’s just too much and some things are too long ago to make sense of the exact order and date. I really hate this, since like you, I love documenting life and pictures. I try to just keep up with art journalling and let that be the one thing where I make sure I have a continuing line of documentation in my life. Hi, Hanna! I loved the Archive-Along. And your book, A Creative Year, has a place of honor on my shelf. 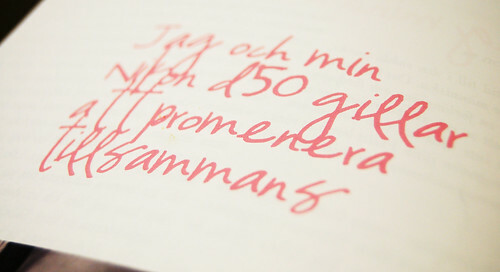 I love that book, as I’ve told you many times, and hold the thought of making my own blog book. 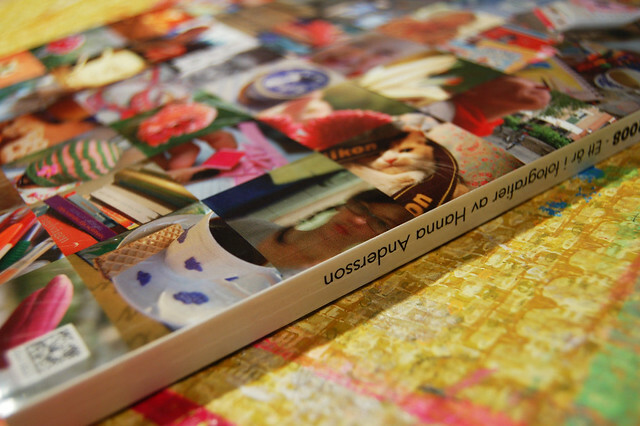 But your idea of the blurb photo book is such a great one! I have so many photos I can’t even say. I would imagine there are a dozen books of photos just in my latest iPhoto account! This is a wonderful idea, just right for my love of books and pictures. But I think it would take SO much time! Certainly it would be worth it for family memories though maybe not of most of the photos I take. Your ideas are intriguing. Thanks for sharing.